The first copy of the Gutenberg Bible brought to the United States, now in the New York Public Library. Although Johannes Gutenberg (1398-1468) is usually credited with having invented printing, it's fairer to say that he introduced a system of mechanical printing to Europe, since virtually all the technologies he employed had already been invented, either in Europe or China. Like most innovators, his flair lay in combining existing methods, modifying and improving as he did so. The revolution in printing instigated by Gutenberg could have happened a century earlier, had someone of his genius lived then. Or later: He was one of about half a dozen Europeans actively researching ways to mechanize printing in the mid-1400s, and surely one of them would have figured out a system if Gutenberg hadn't beaten them to it. The success of an innovation can be gauged by the speed with which it's adopted. 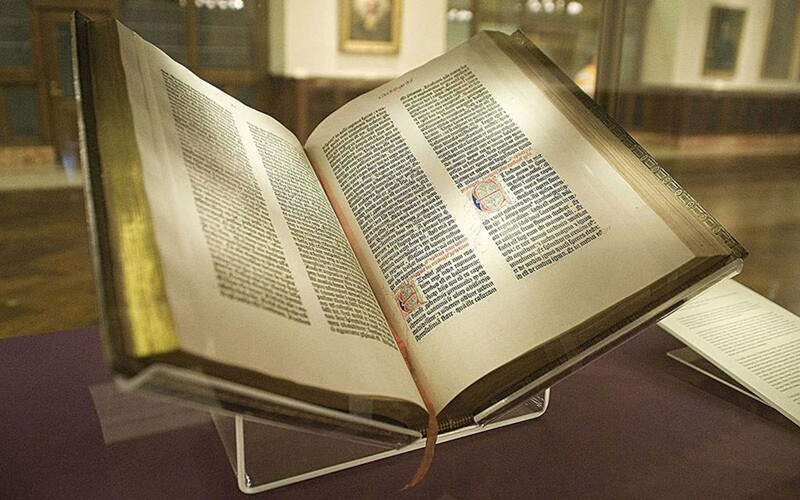 Within 50 years of the publication of Gutenberg's 1,200-page, 42-line Bible in 1455, at least 250 printers were furiously at work all across Europe using his technology. Historians have estimated that 15 million books were printed mechanically between 1455 and 1500, more than the sum total of all books copied manually before then. The revolution in printing, and with it mass communication, extended to virtually every facet of life. It's hard to imagine the Age of Enlightenment or the Scientific Revolution without the ready means to exchange information. Prior to Gutenberg, literacy was considered mysterious or even supernatural by the vast majority of people who couldn't read or write. After him, an unstoppable cycle came into play: Books — lots of books, cheap books! — encouraged literacy, while literacy in turn stimulated the demand for books. The ease with which newly literate people could communicate revolutionized how minds connected to minds. In his book on the Internet revolution, The Shallows: What the Internet is Doing to Our Brains, technology writer Nicholas Carr says, "As books became common, men could look more directly at each other's observations, with a great increase in the accuracy and content of the information conveyed." Not just factual information, either, but fiction too. Think about the last time you lost yourself in a novel as you essentially re-created the author's thoughts in your own brain. That intimate mind-to-mind connection at a distance was all but impossible before Gutenberg. After the printing revolution and the democratization of literacy which followed, authors found ways to share their innermost feelings by writing with "a heightened awareness and closer observation of sensory experience that was passed on in turn to the reader," in the words of historian Elizabeth Eisenstein. Carr claims that, just as the proliferation of books starting with Gutenberg actually changed how we think — for the better, in his opinion — the Internet is changing brains, this time for the worse. Increasingly, we're reading in bite-sized chunks, skimming rather than absorbing, readily distracted by sidebars, pull-quotes and ads. And not just when we're online, since magazines and newspapers are following the trend of computer screens in catering to our novelty-seeking minds. Carr's book is available, ironically, on Kindle for $9.82. Next week, we'll look at the specific technologies adapted, improved and combined by Gutenberg that gave us mechanical printing, arguably the most important event of the last 2,000 years.